A Subaru dealer in Michigan gets egg on its face after running a 30-second ad congratulating the Patriots on winning the Super Bowl. Shortly after the New England Patriots lost Super Bowl LII to the Philadelphia Eagles, 41-33, a Michigan Subaru dealer ran a 30 second ad on Grand Rapids' WOOD-TV congratulating the New England Patriots on the victory. The 30 second, silent ad congratulating the Patriots ran immediately after the game in Grand Rapids, Michigan. The ad had to be produced days ahead of the big game, so someone at the dealer was a fan and was counting on the Patriots winning Super Bowl LII. Tom Brady, the Patriots star quarterback, played college football for the University of Michigan, which could be why Subaru of Muskegon in Michigan was rooting for their famous college quarterback. Brady has quarterbacked the Patriots to eight Super Bowl appearances, the most for any player in history, but he didn’t get his sixth win last night. According to WOOD-TV, the ad is what they were told to air. Soon after the ad aired on local TV in western Michigan, screen shots of the ad started popping up everywhere on social media with commentary from confused viewers. Viewers were surprised by the 30 second Subaru clip. The game was one of the most exciting Super Bowls in recent memory breaking scoring records. It looked like the Patriots would win and on their way back from a double-digit deficit and took the lead 33-32 with 9:22 remaining. But It was Nick Foles, the Eagles backup quarterback, not Tom Brady, who ended up as Super Bowl MVP. Foles threw for 373 yards and three touchdowns, and also caught a touchdown in the Eagles upset win. Most football fans thought the Patriots would win their sixth Super Bowl, but the underdog Philadelphia Eagles had different ideas. 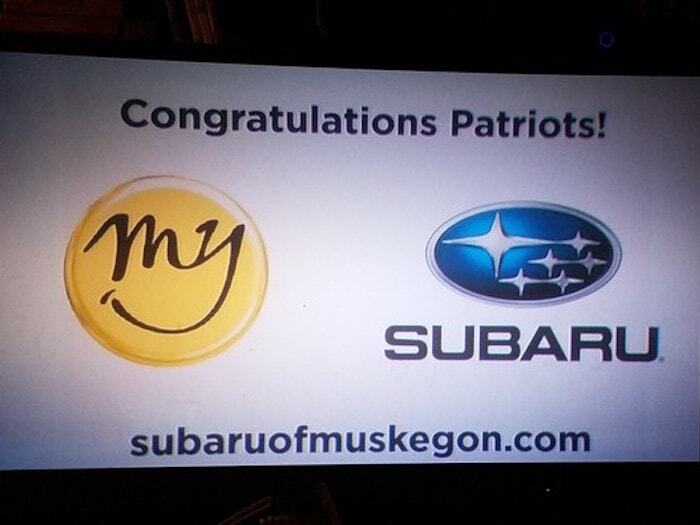 Subaru of Muskegon definitely thought the Patriots would win, and produced the ad congratulating the team on the victory. It actually worked out good for the Michigan Subaru dealer. They’ve received plenty of free social media advertising that has gone viral. As the saying goes, don't count your chicks before they hatch. Way to go Birds! My home town team.